Beeline Telecommunications has been a friend of the Ark for several years. They have shown their support in different ways and this time they decided to organize a 2 day team building event to gather employees and partners around the theme of volunteering. On the first day, volunteers talked about their experiences and we were asked to talk about how the Ark Village was born, its values, and projects for the future. The second day was more hands-on; with kids’ games, drawing, and tree planting. 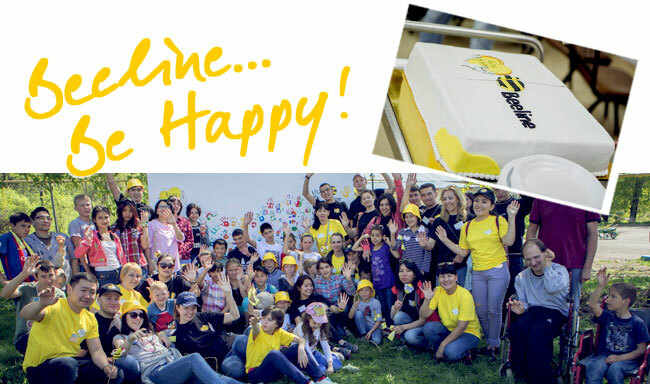 The end of the event was celebrated with a plaque to commemorate the day and a delicious Beeline cake! It is not the first time that the Ark Village birthday was celebrated in a “different” way and probably won’t be the last. To organize a big party would take too much energy from everyone and likely leave just a fading memory. We prefer something more meaningful. Each child is hosted by different friends of the Ark Village who give them a whole day’s worth of experiences doing whatever he/she likes, allowing our children to feel like the center of the party. Once back at home, we share the different experiences and emotions. The Ark Village birthday celebration is truly a joyous occasion for our children and teens. One of the signs that time is passing, besides the growth of the children of course, is the disappearance of the veterans, who each year used to come over to celebrate the victory of the Second World War, giving their eyewitness accounts of those tragic and difficult years. This year, only one veteran was left and since he could not visit due to health issues, some of our kids decided to visit him and keep him company for a while. At the Ark, good weather means more time to spend outdoors and the same goes for the friends and organizations that return every year to spend some time at the Village. Citibank for example, joined a land clearing day organized by our kids and volunteers from the youth movement, Zhas Ulan. We also welcomed numerous guests to work and just spend time with the kids. This time of the year is also used to accomplish some projects proposed by individuals or groups. One of these was the opening of a workshop to repair bicycles. For a few months now, we have noticed a strange phenomenon; our kids seem to enjoy repairing bicycles more than riding them! Now they have a workshop in which to engage this hobby. Others prefer nature and after several years being empty, the rabbit hutches are in use again. Bicycles and rabbits: The last frontiers of hobbies!! The large number of very young children at the Ark does not allow us to travel to all the different locations we are invited to. And so we divide into small groups to travel near and far depending on the activities. We attended a family festival at Gorky in Almaty while the teens took part in a festival of professions organized by the foundation, “A Child Needs a Family”. Then of course, there are invitations to cinemas and theaters by volunteers and friends. The most demanding of these invitations, mostly because of the African like heat, was the trip to Turkistan, where our group visited historical and culturally important places (Watch the gallery). After many doubts and worries, Anvar has made a leap toward his adult life. Thanks to his experience in our tailors’ workshop he has been hired by a textile company in Talgar. Overcoming difficulties, he is getting used to the rhythms, schedules, and rules of the new job that are, of course, more demanding than those of our home workshop. Nevertheless, he is committed and slowly he is learning and becoming capable of managing his own salary and time and thinking about his future. For those who have even a small amount of experience with or in public orphanages, you know that a lack of self-esteem and a fear of not being able to take care of yourself can be very real and so we are even more proud of Anvar who has found the strength and the courage to do it! A great step for Anvar. Something to celebrate! Summer, as you know, is the time to perform maintenance, reconstruction, and improvement works before winter comes. This year, thanks to Renovabis Association, a supporter of past Ark Village renovations, we are completing the thermal insulations of ceilings, external walls, and windows; especially those installed several years ago. All this will provide a significant savings in the heating costs already lowered thanks to last year’s connection to the city-gas line. And finally, many thanks to our friends who spend their time with our children, both at the Village and outside, in games and work alike. Looking for a news in a bulletin? Go to the bulletins archive from January 2014 up today. Here you can find all the old bulletins from January 2011 up to December 2013 and the first historical issue!